For other people named Elizabeth Ryan, see Elizabeth Ryan (disambiguation). Elizabeth Montague Ryan (February 5, 1892 – July 6, 1979) was an American tennis player who was born in Anaheim, California but lived most of her life in the United Kingdom. Ryan won 26 Grand Slam titles. Nineteen of those titles were in women's doubles and mixed doubles at Wimbledon, an all-time record for those two events. Twelve of her Wimbledon titles were in women's doubles and seven were in mixed doubles. Ryan also won four women's doubles titles at the French Championships, as well as one women's doubles title and two mixed doubles titles at the U.S. Championships. Anaheim is a city in Orange County, California, part of the Los Angeles metropolitan area. As of the 2010 United States Census, the city had a population of 336,265, making it the most populous city in Orange County and the 10th-most populous city in California. Anaheim is the second-largest city in Orange County in terms of land area, and is known for being the home of the Disneyland Resort, the Anaheim Convention Center, and two major sports teams: the Anaheim Ducks ice hockey club and the Los Angeles Angels baseball team. Although she reached the Wimbledon singles finals twice, Ryan never won the title. Eight of her losses at Wimbledon were to players generally considered to be among the best ever. Ryan had to play Dorothea Lambert Chambers in the all-comers final of 1920; Suzanne Lenglen in the 1919 semifinals (losing 6–4, 7–5), 1921 final, 1922 quarterfinals, 1924 quarterfinals (losing 6–2, 6–8, 6–4), and 1925 second round; and Helen Wills Moody in the 1928 semifinals and 1930 final. Suzanne Rachel Flore Lenglen was a French tennis player who won 31 Championship titles between 1914 and 1926. She dominated women's tennis from 1914 until 1926 when she turned professional. A flamboyant, trendsetting athlete, she was the first female tennis celebrity and one of the first international female sport stars, named La Divine by the French press. Lenglen's 241 titles, 181 match winning streak and 341-7 (98%) match record are hard to imagine happening in today's tennis atmosphere. Lenglen is regarded by some to be the greatest female tennis player in history. Martina Navratilova is a Czechoslovak-born American former professional tennis player and coach. In 2005, Tennis magazine selected her as the greatest female tennis player for the years 1975 through 2005 and she is considered one of the best female tennis players of all time. Cuthbert Collingwood "Ted" Tinling, sometimes known as Teddy Tinling, was an English tennis player, fashion designer, spy and author. He was a firm fixture on the professional tennis tour for over sixty years and is considered the foremost designer of tennis dresses of the 20th Century. Sarah Hammond Palfrey Danzig was an American tennis player whose career spanned two decades from the late 1920s until the late 1940s. She won the singles title at the U.S. Championships in 1941 and 1945. Alice Marble was an American tennis player who won 18 Grand Slam championships (1936–40): five in singles, six in women's doubles, and seven in mixed doubles. ACF = All comers final, with the winner to play the defending champion. 1 2 3 Through 1923, the French Championships were open only to French nationals. The World Hard Court Championships (WHCC), actually played on clay in Paris or Brussels, began in 1912 and were open to all nationalities. The results from that tournament are shown here from 1912 through 1914 and from 1920 through 1923. The Olympics replaced the WHCC in 1924, as the Olympics were held in Paris. Beginning in 1925, the French Championships were open to all nationalities, with the results shown here beginning with that year. Maria Esther Andion Bueno was a Brazilian professional tennis player. During her 11-year career in the 1950s and 1960s, she won 19 Grand Slam titles, making her the most successful South American female tennis player in history, and the only one to ever win Wimbledon. Bueno was the year-end number-one ranked female player in 1959 and 1960 and was known for her graceful style of play. Helen Newington Wills, also known as Helen Wills Moody and Helen Wills Roark, was an American tennis player. She became famous around the world for holding the top position in women's tennis for a total of nine years: 1927–33, 1935 and 1938. She won 31 Grand Slam tournament titles during her career, including 19 singles titles. 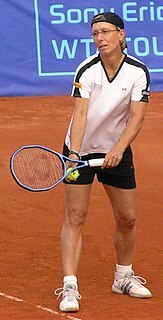 Françoise Dürr is a retired French professional tennis player. She won 26 singles titles and over 60 doubles titles. Anna Margrethe "Molla" Bjurstedt Mallory was a Norwegian tennis player, naturalized American. She won a record eight singles titles at the U.S. Championships. Shirley June Fry Irvin is a former world No. 1 tennis player from the United States. During her career, which lasted from the early 1940s until the mid-1950s, she won the singles title at all four Grand Slam events as well as 13 doubles titles. 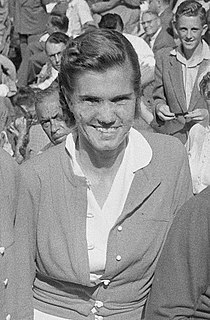 As of 2018, Fry Irvin is the longest surviving female Grand Slam singles champion. Althea Louise Brough Clapp was an American tennis player. During her career between 1942 and 1957, she won six Grand Slam singles titles as well as numerous doubles and mixed doubles titles. She was ranked world no. 1 by Lance Tingay in 1955. Mary Kendall Browne was an American professional tennis player and an amateur golfer. She was born in Ventura County, California, United States. Hildegard "Hilde" Krahwinkel Sperling was a German tennis player who became a dual-citizen after marrying Dane Svend Sperling in December 1933. She won three consecutive singles titles at the French Championships from 1935 to 1937. Krahwinkel Sperling is generally regarded as the second-greatest female German tennis player in history, behind Steffi Graf. Sperling played a counterpunching game, predicated on speed, and wore down opponents. Helen Jacobs once wrote that Sperling was the third-best player she ever played, behind Helen Wills Moody and Suzanne Lenglen. Pénélope Julie "Diddie" Vlasto Serpieri was a female tennis player from France. She won the silver medal at the Paris Olympics in 1924 in women's singles, losing the final to Helen Wills Moody. Vlasto also won the version of the French national championships in 1924 that was open only to French nationals. She was a doubles partner of Suzanne Lenglen in many doubles tournaments during the early 1920s. Karen Susman is a retired female tennis player from the United States. She won the 1962 women's singles title at Wimbledon, defeating Věra Pužejová Suková in the final 6–4, 6–4, but did not defend her title in 1963. She won three Grand Slam women's doubles titles, all with Billie Jean King. She also won the 1960 Wimbledon junior girls' singles title. Simonne Mathieu was a female tennis player from France, born in Neuilly-sur-Seine, Hauts-de-Seine who was active in the 1930s. Her first name is spelled "Simone" in many sources. Maud Margaret 'Mall' Molesworth was a tennis player from Queensland, Australia who won the inaugural Australasian Championships women's singles title in 1922 and 1923. Yolanda 'Yola' Ramírez Ochoa is an internationally renowned tennis player active in the 1950s and 1960s. She is not related to Raúl Ramírez, a Mexican player of the 1970's and 1980's. The 1973 Wimbledon Championships was a tennis tournament that took place on the outdoor grass courts at the All England Lawn Tennis and Croquet Club in Wimbledon, London, United Kingdom. The tournament was scheduled to be held from Monday 25 June until Saturday 7 July 1973 but rain on the final Friday meant that the women's singles final was postponed until Saturday and the mixed doubles final was rescheduled to Sunday 8 July. It was the 87th staging of the Wimbledon Championships, and the third Grand Slam tennis event of 1973. Jan Kodeš and Billie Jean King won the singles titles. The 1979 Wimbledon Championships was a tennis tournament that took place on the outdoor grass courts at the All England Lawn Tennis and Croquet Club in Wimbledon, London, United Kingdom. The tournament ran from 25 June until 7 July. It was the 93rd staging of the Wimbledon Championships, and the second Grand Slam tennis event of 1979. Phoebe Catherine Holcroft Watson was a tennis player from the United Kingdom whose best result in singles was reaching the final of the U.S. Championships in 1929, losing to Helen Wills in straight sets. According to A. Wallis Myers of The Daily Telegraph and the Daily Mail, Watson was ranked in the world top ten in 1926 and from 1928 through 1930, reaching a career high of World No. 2 in 1929. Phyllis Helen Satterthwaite was a female tennis player from Great Britain who was active from the early 1910s until the late 1930s. 1 2 3 Bud Collins (2008). The Bud Collins History of Tennis: An Authoritative Encyclopedia and Record Book. New York, N.Y: New Chapter Press. p. 618. ISBN 0-942257-41-3. ↑ Ted Tinling (1980). John Gilchrist Barrett, ed. "World of Tennis 1980: A BP Yearbook - The King-Ryan Connection". London: Queen Ann Press: 56. 1 2 Bud Collins (1989). My Life With the Pros. New York Ciry: E.P. Dutton. p. 261. ISBN 0-525-24659-2. ↑ Bud Collins (2008). The Bud Collins History of Tennis: An Authoritative Encyclopedia and Record Book. New York City: New Chapter Press. pp. 695, 701. ISBN 0-942257-41-3. ↑ United States Tennis Association (1988). 1988 Official USTA Tennis Yearbook. Lynn, Massachusetts: H.O. Zimman, Inc. p. 260. ↑ Will Grimsley (July 8, 1979). "King's Rejoicing Subdued Following 20th Wimbledon Title". Ocala Star-Banner . Associated Press. p. 1C – via Google News Archive. ↑ "Ryan Dies at Wimbledon". The Milwaukee Journal . Associated Press. July 7, 1979. p. 12 – via Google News Archive. ↑ John Barrett, ed. (1980). World of Tennis 1980: a BP yearbook. London: Queen Anne Press. pp. 43, 376. ISBN 9780362020120. OCLC 237184610. ↑ Collins, Bud (1989). My Life With the Pros. New York: E.P. Dutton. pp. 259–60. ISBN 0-525-24659-2. ↑ Brace, Reginald; King, Billie Jean (1981). Play Better Tennis: With Billie Jean King and Reginald Brace. Octopus. p. 21. ISBN 0-7064-1223-0.